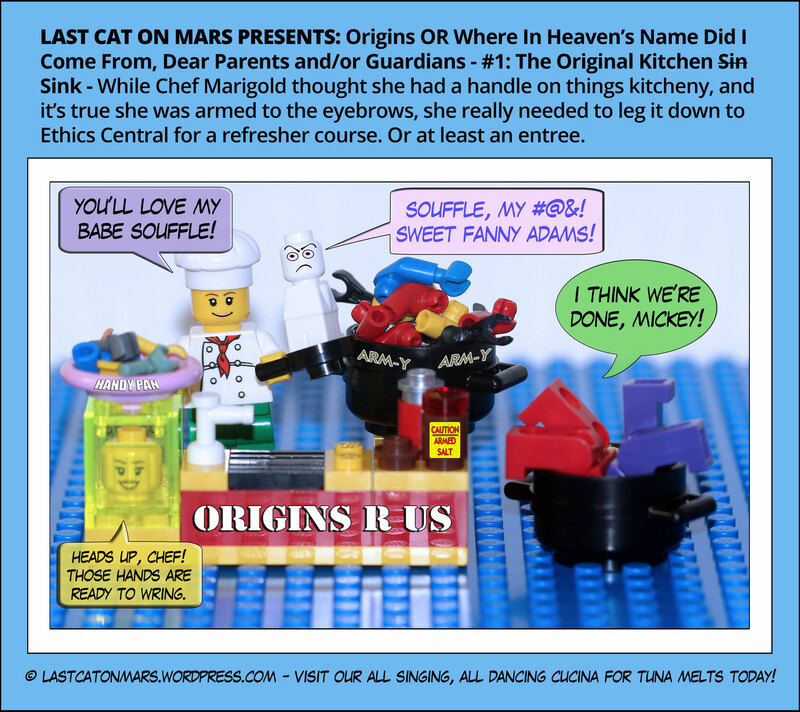 Last Cat On Mars Presents: Origins OR Where In Heaven’s Name Did I Come From, Dear Parents and/or Guardians – #1: The Original Kitchen Sin – Sink. Not my cup of tea, I must say, this souffle of clone-iness. But bits and pieces do add up, over time. Did you know that felis catus domesticus is descended from the wild cats of the Fertile Crescent in the Middle East. Yes, some of us are Egyptian, Pharaonic even, and so were our Mummies. 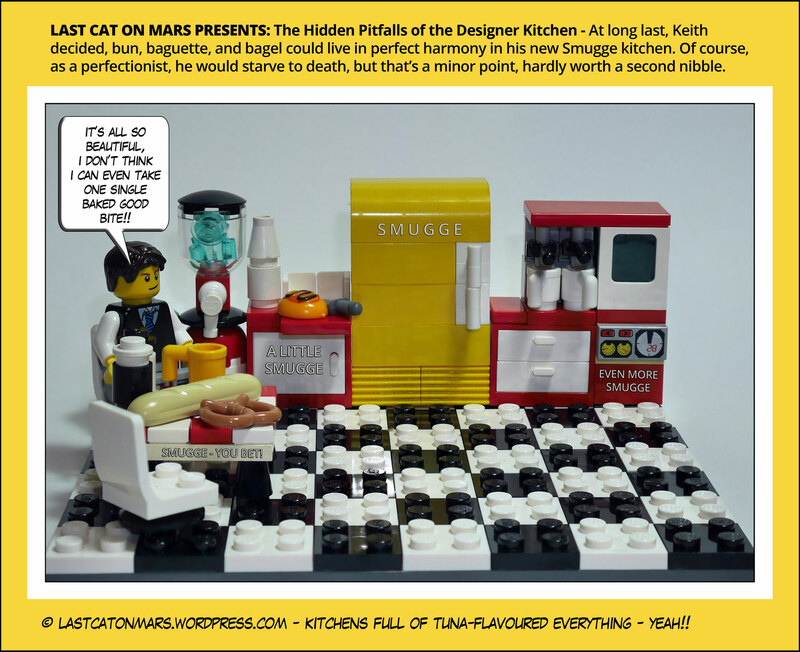 This entry was posted in Science, Variety Show and tagged arms, cartoon, comic, felis catus domesticus, hands, kitchen, lego, legs, minifigures, origins, torsos on April 19, 2017 by Jay Verney. Here on Mars, there’s little space for large kitchens, but the space we have we dedicate to delicacies close to the hearts of all self-respecting Martians: tuna toast, tuna pie, tuna salad, tuna bake (very hot this close to the Sun), tuna fritters, tuna pizza, and so on, and occasionally, a lovely side of totally, totally Martian red Truss tomatoes with deep-fried tuna steaks. Bon appetunatit!!! This entry was posted in Variety Show and tagged bagel, baguette, bun, cartoon, comic, designer, food, fridge, kitchen, kitchen appliances, lego, minifigure, smugge on October 5, 2016 by Jay Verney. 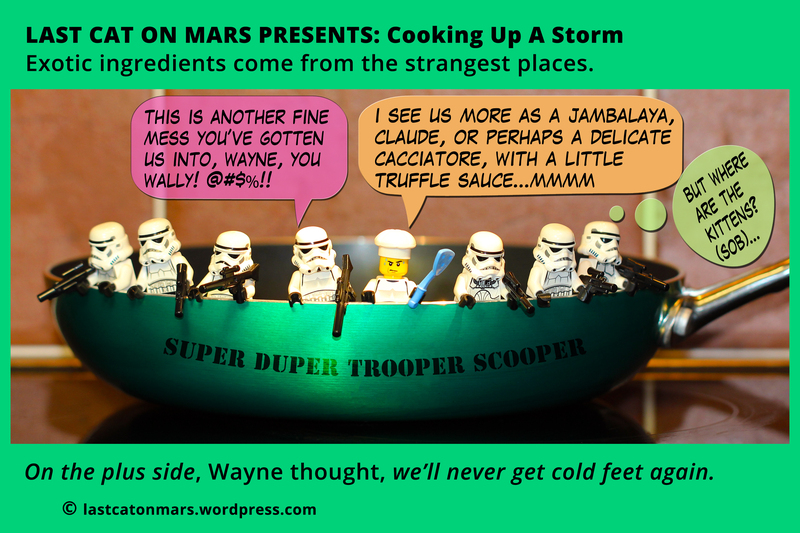 This entry was posted in Space, Variety Show and tagged chef, cooking, frying pan, kitchen, lego, minifigures, Stormtrooper, Wayne on November 6, 2014 by Jay Verney.